The world seems to be divided into "creative" and "non-creative" people. Most people think that "one is either born creative or not, and I'm not!" and resign themselves to that thought. Yet we know that creativity is essential to success in any discipline or industry. According to a recent IBM survey of chief executives around the world, creativity is the most sought-after trait in leaders today. And the fact is that all of us are born creative. As children, we are highly imaginative and exploratory in all that we do. But over time, because of social interactions and formal schooling, we start developing fears - fear of judgement, fear of failure, fear of uncertainty; and these fears stifle our imagination and courage. 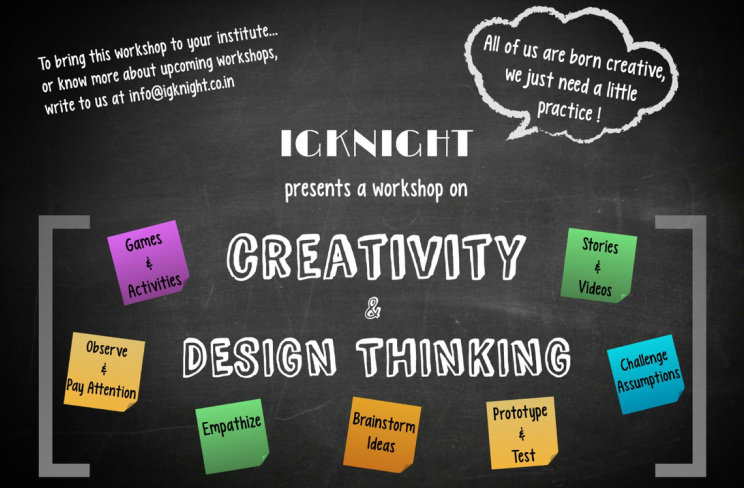 So, we are introducing a workshop that will help you overcome these fears and rediscover your creative confidence. If you want us to conduct this workshop in your school or organization, please contact us.